Class members (from left) Kate Brown, Teresa Smith, Kimberly Sombke and Matt Davis discuss their group project at the end of Community Issues Day. The team will work to establish a “sensory” garden at J.B. Stephens Elementary School, where Davis is principal. The 2016-17 class of Leadership Hancock County broke up into groups on Community Issues Day and began work on their community projects. The six projects are an eclectic collection of initiatives sponsored by nonprofit groups and will help the classmates develop their teamwork skills. The groups will produce presentations on their projects that they will present at their graduation in May. Here are summaries of the projects and the team members who will undertake them. These descriptions come directly from the sponsors’ applications. Team members: Jennifer McMillan, NineStar Connect; Debbie Grass, Eastern Hancock High School; Jennifer Frye, city of Greenfield; Jennifer Stanley, Hancock Regional Hospital. BackPacks of Hope provides backpacks filled with supplies to people who are without permanent homes in Greenfield and, more recently, Hancock County. The backpacks have supplies that are meant to provide comfort and care to those who no longer have permanent homes. These people can be living in wooded areas, in their vehicles, with friends and family, in abandoned structures or in transient hotels. BPoH serves those without permanent homes in Hancock County. The Foundation will serve new non-profit organizations needing funds to begin their programs BPoH allows those without permanent homes to have a better quality of life. Supplies include a blanket, hat/gloves, bandages and antibiotic cream, hygiene and other personal care supplies, as well as entertainment items (puzzle books, toys for children). This meets the needs of the people without permanent homes and can make them less dependent on others. While this is certainly not a guarantee, it is hoped the supplies will give the person the motivation to look for more permanent housing and employment. Team members: Rachel Cremeans, Kindred Healthcare; Aaron O’Connor, Hancock Regional Hospital; Summer Grinstead, city of Greenfield; Robert Harris, Hancock County Sheriff’s Department; Rachel Dennis, Alternatives Inc. Alternatives Inc. strives to eradicate domestic and sexual violence in central Indiana through education, prevention and intervention. Alternatives is a domestic and sexual violence shelter for victims from six counties, including Hancock. Shelter services include food, clothing, emergency shelter, individualized case management and children’s programming. The agency also provides advocacy, outreach and education. We are requesting the assistance of LHC participants to utilize their professional skills, talents and community connections to create, plan and implement an awareness event and or fundraiser. April is Sexual Assault Awareness Month. We would like to take the opportunity to engage community members in awareness, education and prevention activities. Incorporate awareness of sexual assault in Hancock County through an organized event. Create a plan for advertising the event throughout the county. Engage a minimum of 100 Hancock County residents in an awareness and/or fundraising event during the month of April. The Landing serves about 300 students a month. The majority come from Hancock County. Most have engaged in destructive behavior — 70 percent of them, for example, have reported cutting themselves on purpose — and virtually all of them have abused drugs and/or alcohol. Two teens with whom the organization is working have attempted suicide in the past year, and its crisis hotline engages frequently with teens who are contemplating suicide. Team members: Lisa Thompson, Hancock Regional Hospital; Rob Caird, Greenfield Banking Co.; Susie Coleman, Greenfield-Central High School; Marie Felver, Hancock County Community Foundation. Establish a corps of volunteers to oversee the LFL stations throughout the county. This project is sponsored by the Hancock County Arts and Cultural Council and Greenfield Main Street. The arts council fosters, supports and promotes the arts, humanities education and cultural activities. Greenfield Main Street promotes downtown commerce and historic preservation. The project focuses on researching the history of several downtown buildings that are in prime locations for a mural that relates to the original history of that building. To contact the current building owner to gauge interest in having a mural depicted on the side of their building. To discuss with the city’s planning department the goal of several murals in downtown Greenfield to confirm any policies the effort would have to adhere to. To research mural artists local and statewide who would have an interest in painting a mural in downtown Greenfield. Determine cost and research grant opportunities. Many students do not experience the outdoors on a regular basis. This destination would allow visitors to not only view aesthetic beauty but also use their other senses to enjoy nature. Teachers will use the garden to complement the curriculum. The original concept would be put in place at J.B. Stephens Elementary School in Greenfield. The garden would focus on the five senses: touch, taste, smell, sight and sound. The garden would have separate beds dedicated to the senses. The smell garden, for example, would include various fragrant plants. Taste would have edible varieties. The sound garden would include a water feature and wind chimes. The project team will create base plan that can be shared with other schools. The class of 2016-17 heard from representatives of 10 nonprofit groups during roundtable discussions on Community Issues Day. They were (top row, from left) Denise Arland, FUSE; Kim Hall, Mental Health Partners of Hancock County; Linda Hart, Hancock County Senior Services; Lisa Heady, Hancock County Children’s Choir; and Nicole Mann, Jane Pauley Community Health Center. 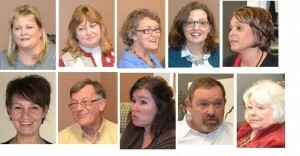 Also, (bottom row, from left) Linda Ostiweg, The Landing; Jim Peters, Love INC; Kathleen Vahle, Meals on Wheels of Hancock County; Kurt Vetters, Edelweise Equine-Assisted Therapy Center; and Judy White, Hancock County Women’s Resource Center. Their comments after Community Issues Day said it all. “Very eye-opening,” said another class member. Their reactions came at the end of a busy class day in which the 25 class members surveyed the breadth of Hancock County’s nonprofit community. From large groups (United Way of Central Indiana and the Hancock County Community Foundation) to small ones (FUSE and Edelweiss Equine-Assisted Therapy Center), the class received a broad education in the agencies that assist those in need. The Landing, 18 W. South St., Greenfield, played host to the group for the day. The Landing is a youth center that offers support to at-risk young people. The class day began with a “poverty simulation” designed to illustrate the hard choices families must make when they encounter crisis. 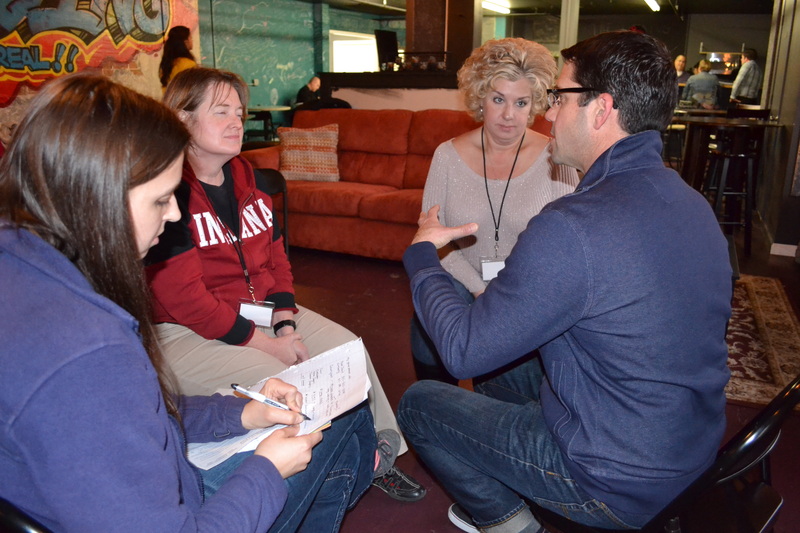 The class members struggled to prioritize expenses when the moderator, Paula Jarrett, area east director for United Way of Central Indiana, told them they had to eliminate a chunk of their fictional families’ income because of a job loss. Some gave up health insurance to cut expenses. Others surrendered their cell phones. Everyone chafed at the choices. There were no wrong answers. Only difficult ones. The class also spent nearly two hours of their day in roundtable discussions with directors of nonprofits, who explained their agencies’ roles in the community. Many real-life families from their earlier poverty scenarios, they learned, depend on the services these agencies provide. The class also heard an enlightening presentation from Mary Gibble, president of the Hancock County Community Foundation, who gave the class an inside look at the makeup of nonprofits and the importance of volunteering for nonprofit boards. After enjoying lunch at the Kenneth Butler Memorial Soup Kitchen in downtown Greenfield, the class toured the Hancock County Food Pantry and Hancock Hope House, the county’s transition shelter for those who have lost their homes. As the class toured the food pantry and listened to director Tom Ferguson describe the challenge to feed the hungry in the county, a vehicle pulled up to the loading area with a collection of donations. Peeling off from the group, several class members helped unload the groceries, piling the bags onto a cart so the items could be sorted and brought to the pantry floor. It was a fitting object lesson on a day dedicated to learning about those who help others.